Althea Gibson was the first African American woman to compete in the prestigious tennis tournaments at Wimbledon in England and the U.S. National Championships in Forest Hills, Long Island. She won both tournaments in 1957 and 1958. After retiring from tennis in 1958 and a brief stint in the entertainment industry, Gibson entered professional golf and was the first African American woman to compete with the Ladies Professional Golf Association (LPGA), from 1963 to 1967. In the following decades, she was a tennis coach and mentor to young athletes; in 1999, the Althea Gibson Early Childhood Education Academy in East Orange, New Jersey, honored her athletic accomplishments. Carl Van Vechten. 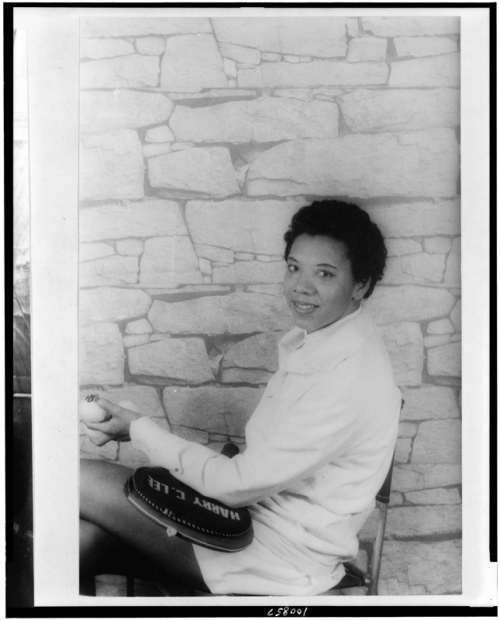 Portrait of Althea Gibson, holding tennis ball and racket, 1958. Library of Congress, Prints and Photographs Division, Washington, D.C.